The church that you see here today was not the original structure built on this site in 1750. The earlier church was made of wood; its chimney can still be seen in the interior of the current church. Here, Samuel Niles was one of the first in a long line of Indian ministers that had connections to the Narragansett Indian Church. 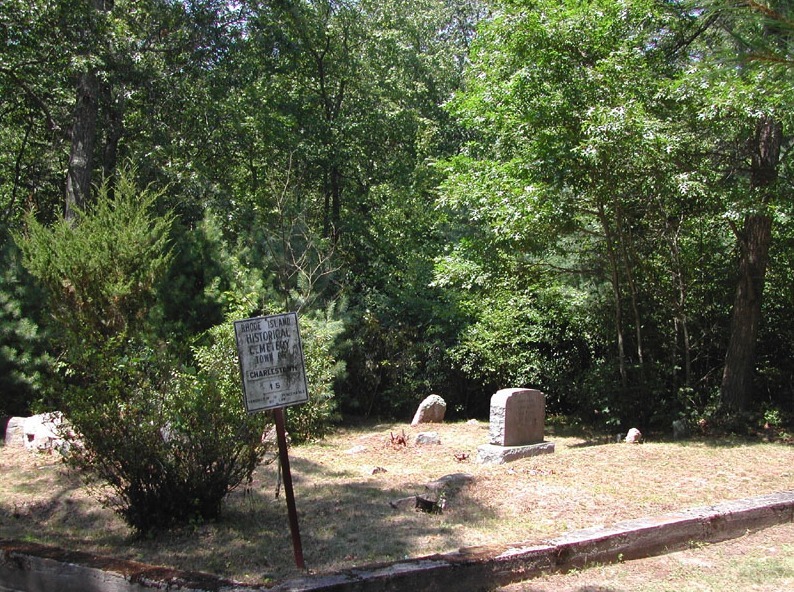 Upon his death in 1785, Niles was laid to rest in the church's burial ground. He was dearly loved by his family and community, having one of the most finely carved headstones in the cemetery. Niles was born in 1706 and served as a traditional spiritual leader, or pawwaw, to the Narragansett before converting to Christianity during the "Great Awakening." Niles was not accepted by the English and accused of preaching without license. 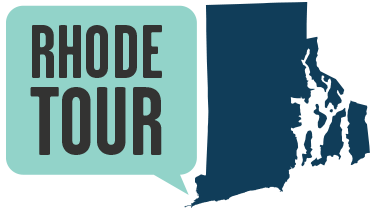 In 1750, Niles formed a Separatist Christian community and served many Native communities throughout his life, including the Narragansett, Niantic, Mohegan, Montauk, and Pequot. Niles broke from traditional Christianity in many ways. For one, while he was accepted by his Native peers, he was never properly ordained through the process of the "laying of hands." Secondly, he was illiterate; though, this did not stop Niles from preaching the word of God in his own way. Revolution was on the minds of many in 1776, including the Narragansett, who expelled minister Joseph Fish and schoolmaster Edmund Deake from the reservation. Both were working and living there, having been sponsored by the New England Company. The Narragansett preferred the preaching of fellow Indians, whether sanctioned or not. For some time, Fish had decried the Narragansetts' preferences, saying in a letter "They had rather follow that ignorant, proud, conceited, obstinate Teacher, poor Samuel Niles, than Attend regular preaching of Sound Gospel Doctrine." The Narragansett likely preferred Niles because he blended their traditional ways with Christianity. For one, Niles understood the importance of their annual powwow. Accordingly, he ensured that the powwow was sponsored by the Church. Niles was politically involved in his community at a rather tumultuous time. By the mid/late 18th century, the English strategy to abuse, intoxicate, and lure Native people into debt was taking its toll on every tribe in the region. 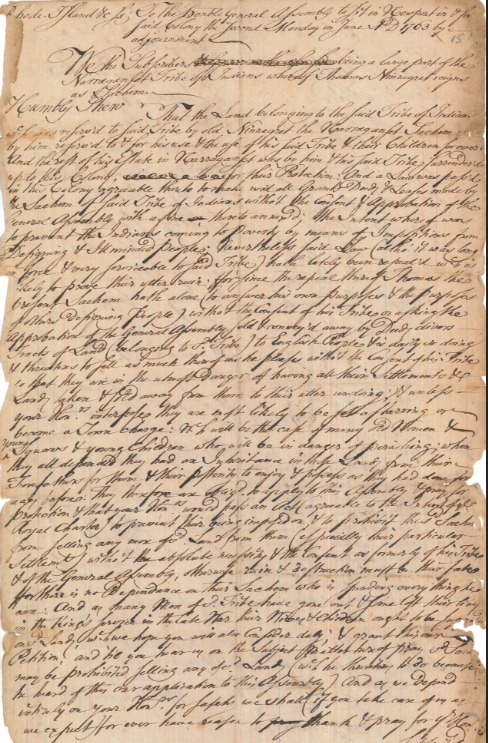 Niles opposed the actions of Sachem Thomas Ninigret (1738-1769), who was illegally selling Narragansett land. Many of the land sales were done in response to immense debt that Thomas Ninigret and his family (not the tribe) had accrued in Rhode Island and abroad while Thomas attended school in England, an arrangement made for him and his family when "King Tom' was still a boy. Niles and other Narragansett tribal members urged a moratorium on the sale of Narragansett lands, while others demanded he step down as Sachem. A temporary moratorium on land sales was granted in 1767. Niles continued to preach until his death in 1785. One of the most famous Indian preachers of the 18th century, Mohegan minister Samson Occom, saw Niles as a true mentor. 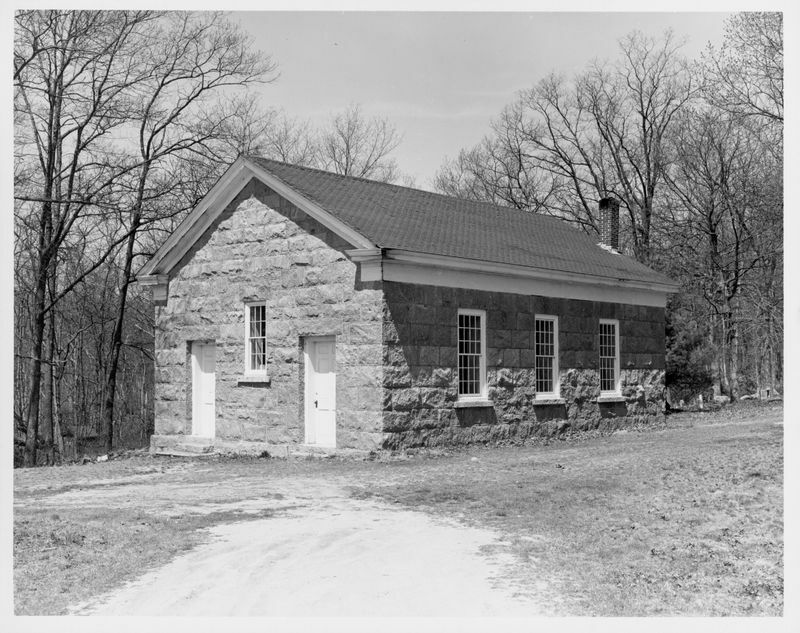 Narragansett Indian Church: The stone Narragansett Indian Church was constructed in 1859; it replaced the original wooden one built in 1750. Arson destroyed the Church's roof and interior in 1993. It was rebuilt in 1996 to the same specifications. 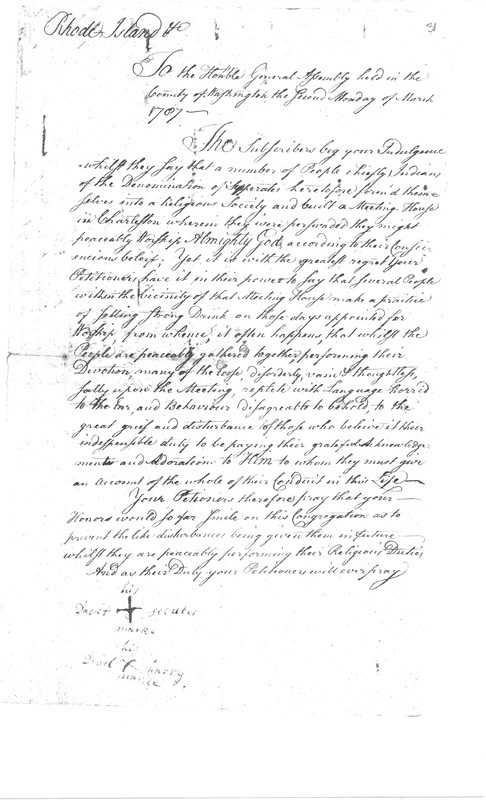 Petition of Narragansett Indian Tribe Against Sale of Land: Here is the first page of the petition against the sale of Narragansett tribal land by Thomas Ninigret in 1763. The following pages include the signatures of many Narragansett. 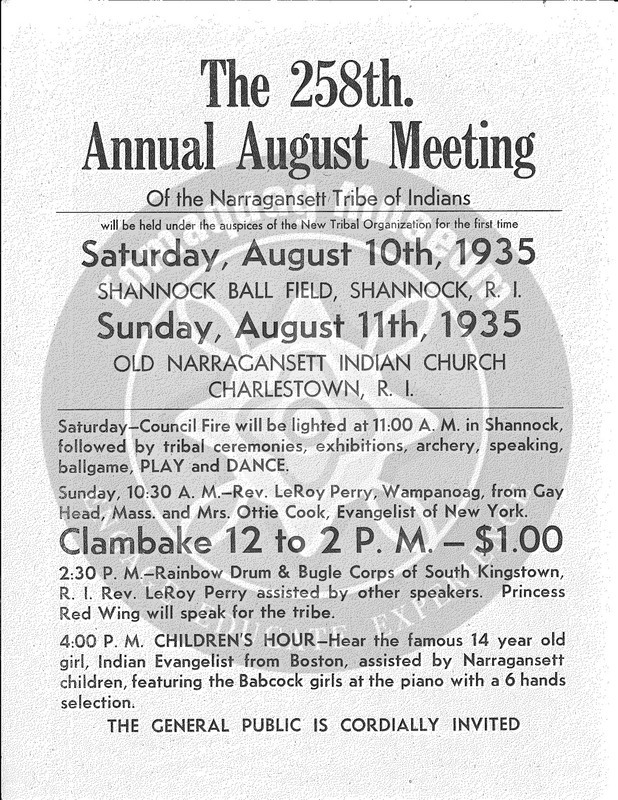 Public Invitation to the 258th Annual Meeting: In 1935, this flier would have been distributed far and wide to invite the public and members of the Narragansett Tribe to the annual meeting (powwow). 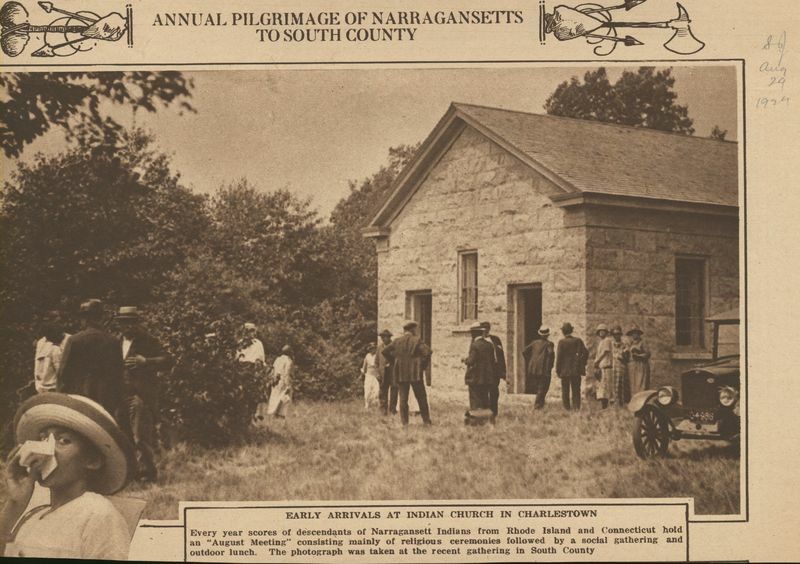 Newspaper Clipping of "Annual Pilgrimage": This newspaper clipping from August 29, 1929 details the "Annual Pilgrimage of Narragansetts to South County," i.e. the annual powwow. 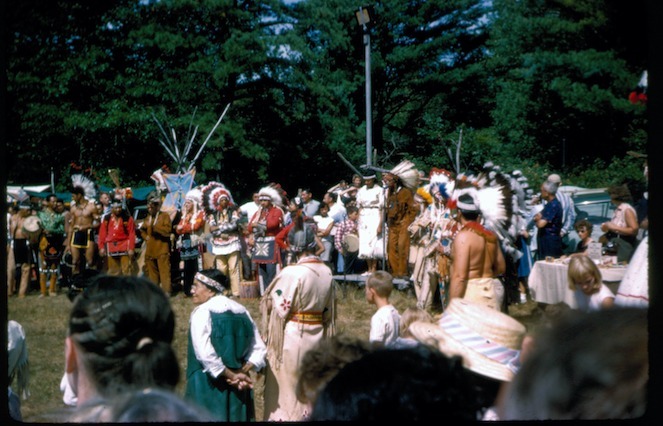 Narragansett Powwow: Here is an image of the annual Narragansett Indian powwow on August 13, 1961. The Narragansett Indian Tribe's Powwow is the oldest recorded Native gathering in the country and is held every August on the church grounds, which include 2.5 acres of land that have never left the Narragansett community. Katharine Kirakosian and Tomaquag Museum, “Samuel Niles,” Rhode Tour, accessed April 21, 2019, http://rhodetour.org/items/show/297.